Into the middle of summer and still establishing themselves very slowly. 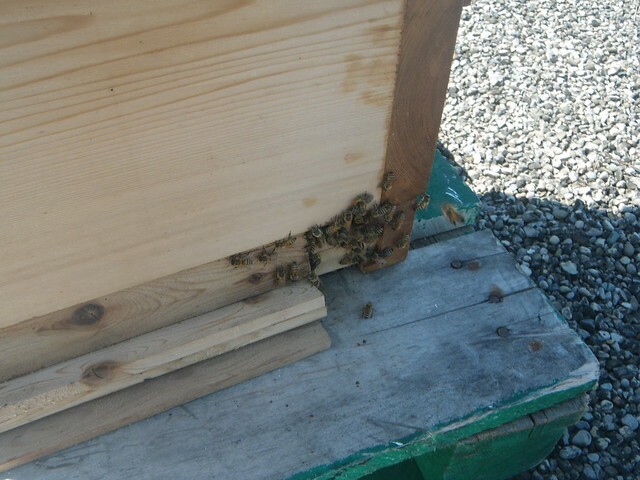 The nuc box had lots of brood. 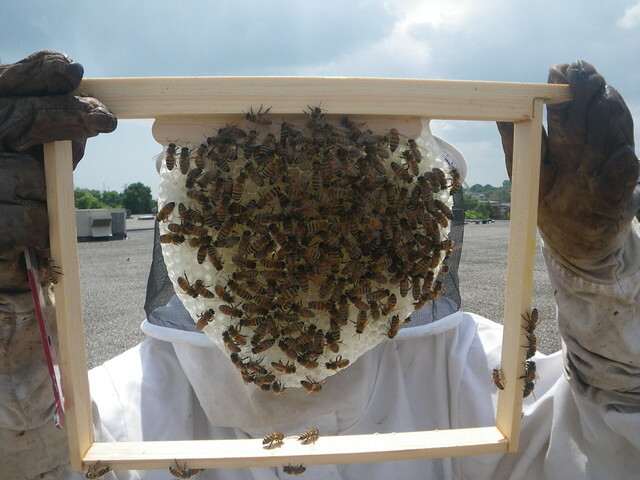 and a frame with one side of capped honey. They didn't expand their brood nest down. 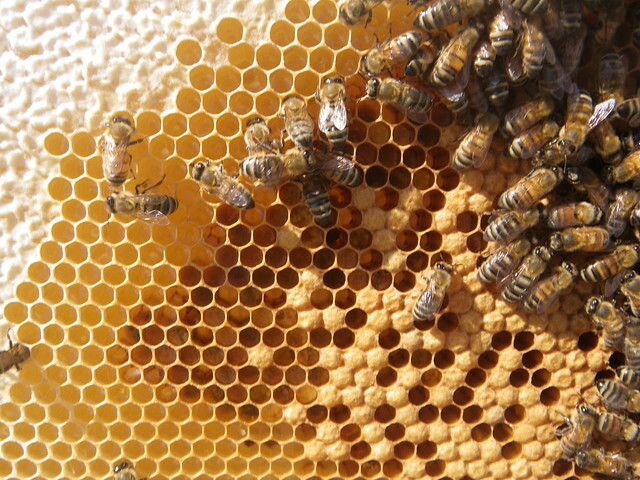 We moved the nectar to the sides and the undrawn to the centre. This was a bit of a disappointment as we are really eager for them to expand their population. 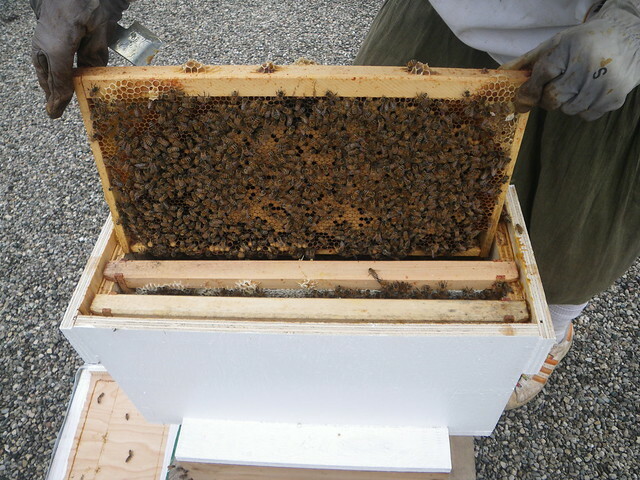 Added a new warré frame to the nuc box, in the hopes we can use it to encourage brood nest expansion. 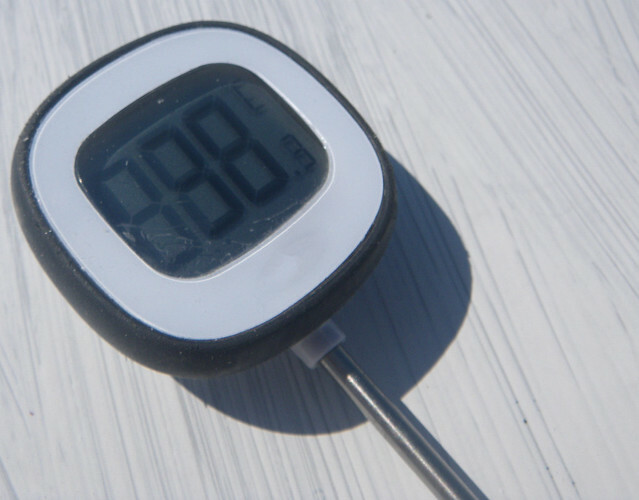 Very hot day, during the middle of a heat wave in an otherwise cool summer. 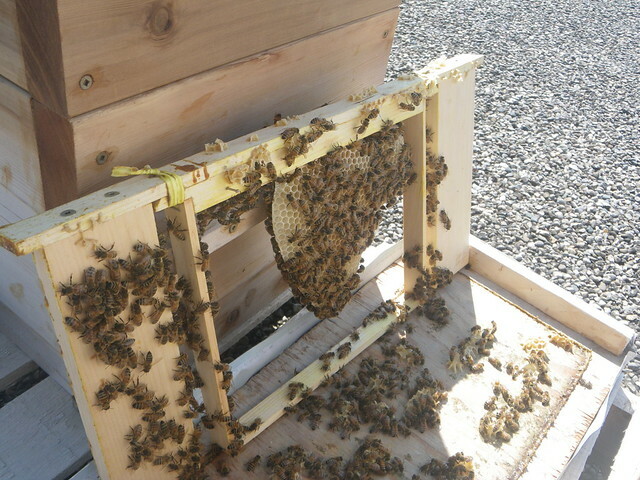 The built a decent size comb on the warré frame added to the nuc box. 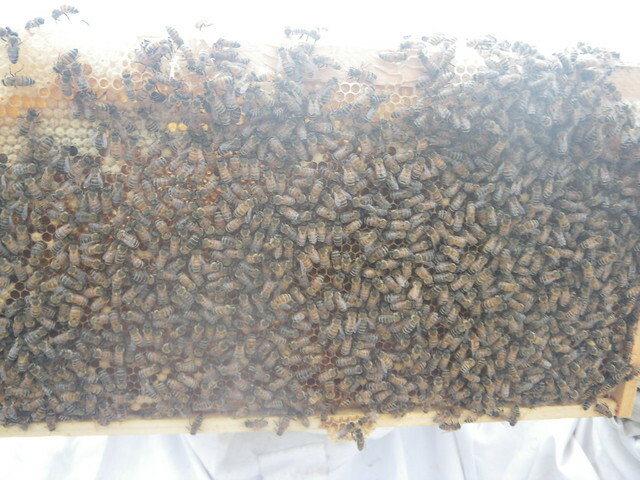 Some nectar on the top and loads of eggs. 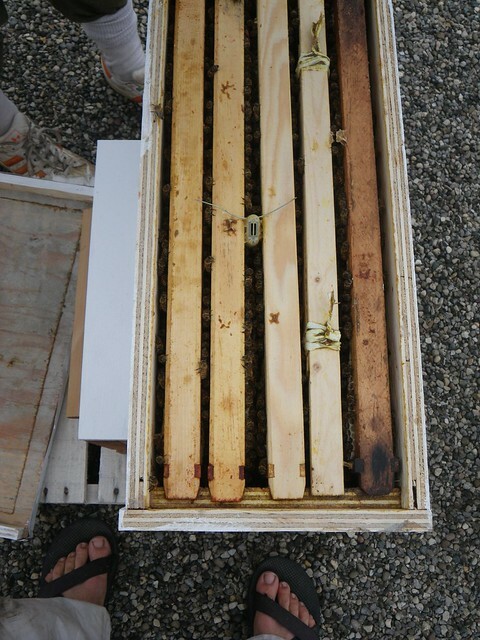 We seeded this frame in a new box placed between the bottom warré box and the top nuc adapter box. The bottom box had only one new comb started. I moved this to the centre, leaving an empty frame on either side. The entrance was looking a little crowded. So I opened up the reducer to about half way. 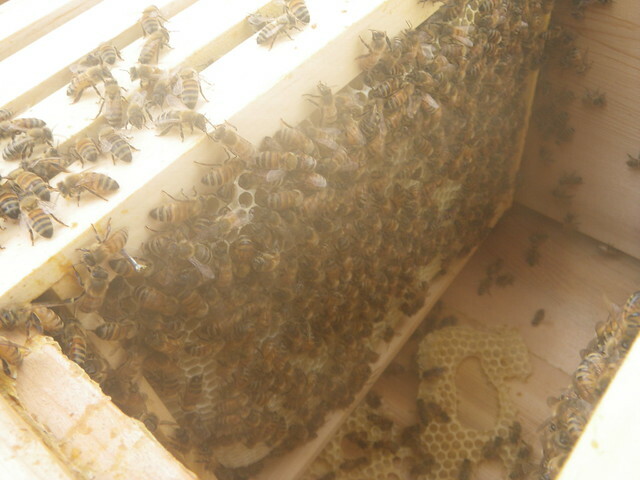 Only two new combs and a little bit started in the new box. 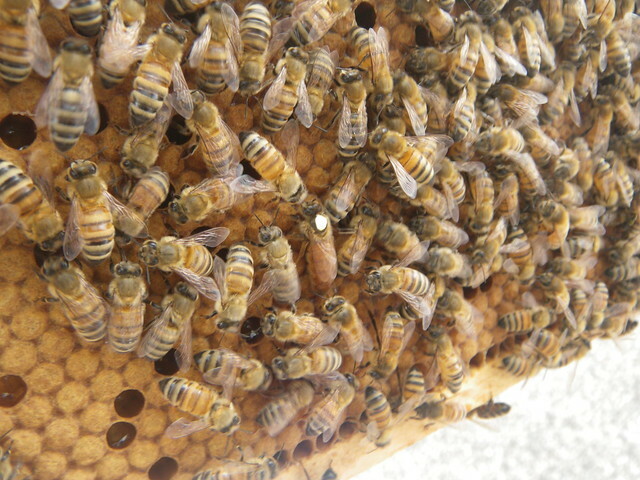 Most of the brood had hatched out on the original seed frame. 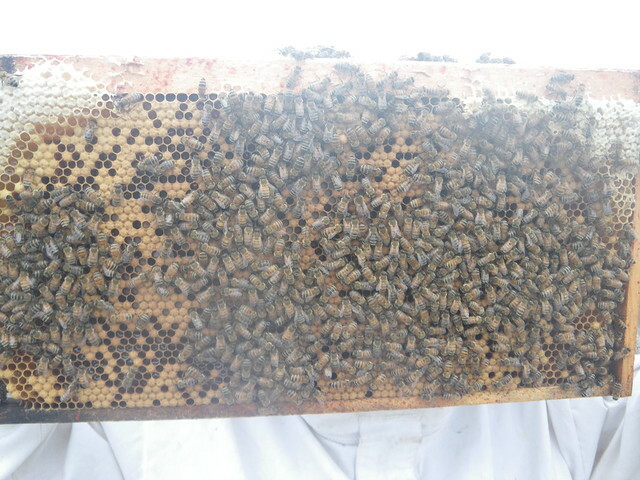 We also had some young brood and eggs, and possibly some drone brood on the new combs. 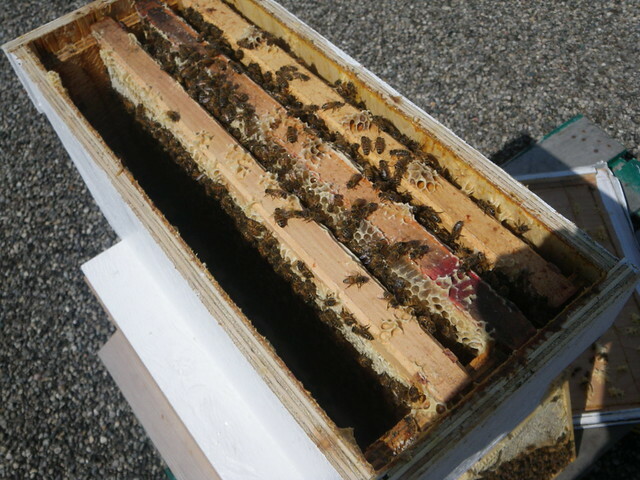 The bottom box had loads of pollen and small amounts of honey. 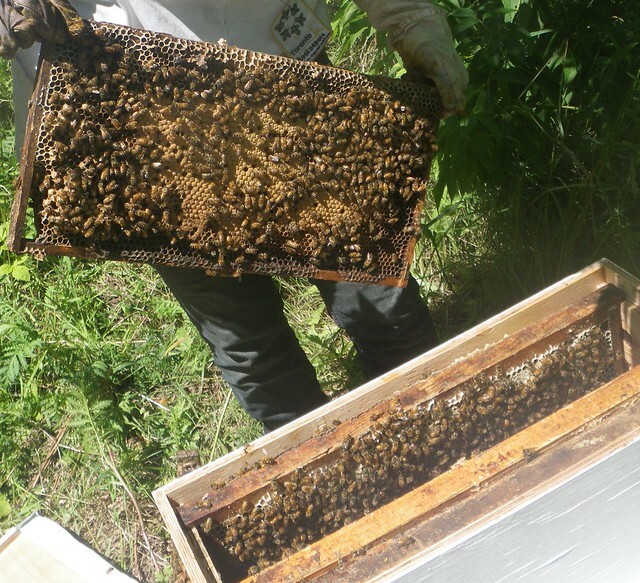 I moved a little up to be close to the brood and scored some of the honey. 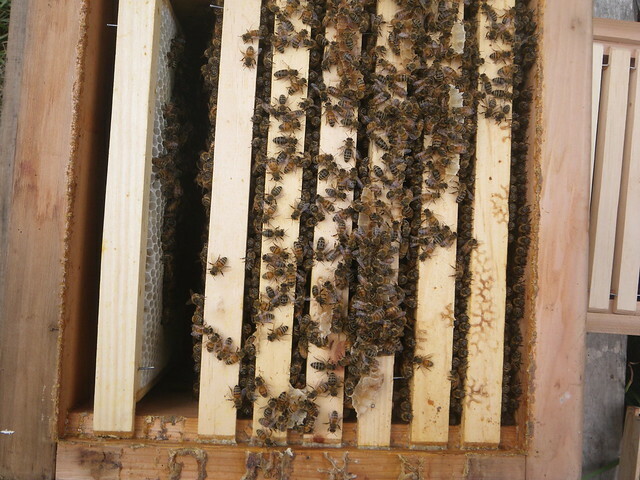 Still lots of brood in the top nuc box. Though the pattern might be verging on spotty. 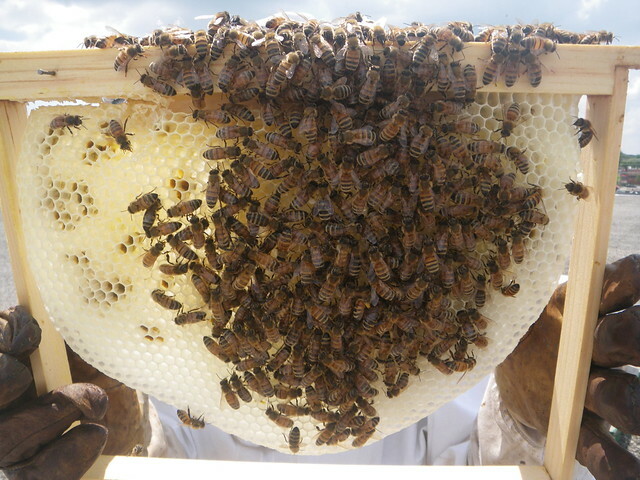 Still just the one side of comb with solid honey. 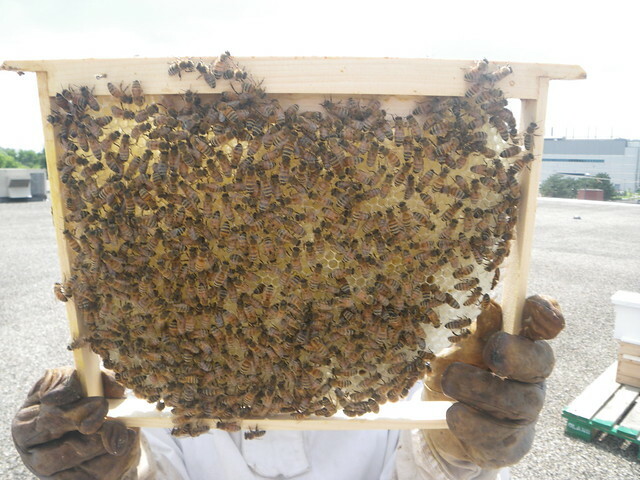 I scorred it to see if that could help stimulate more comb building and brood. I walked around the area but had a hard time figuring out where they might be foraging. 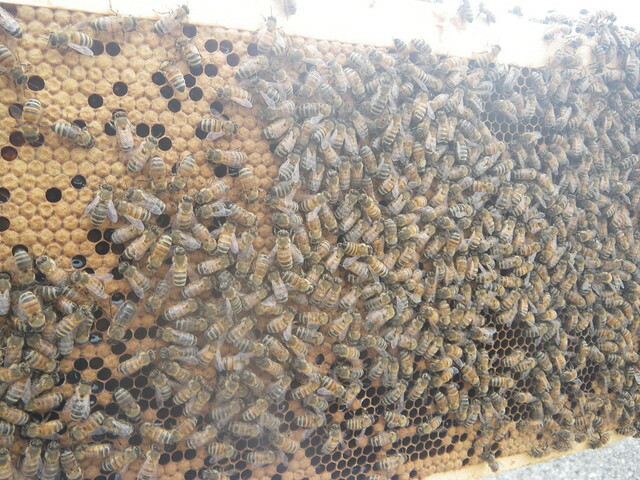 Their were a few houses in the neighbourhood with pollinator gardens but I didn't see any honeybees there. 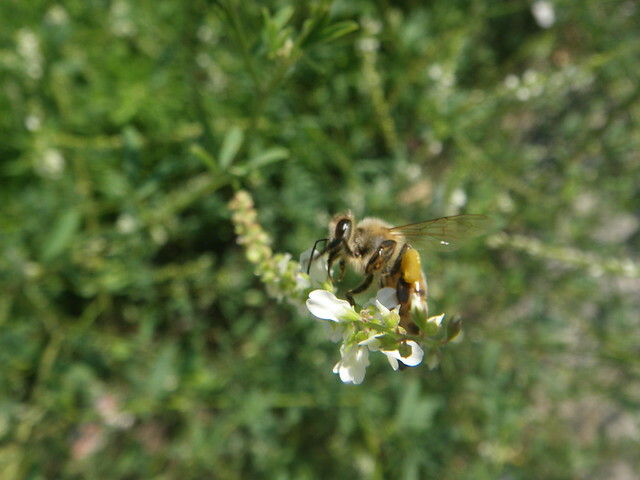 Around the railway tracks and the power line cooridor the sweet clover was still in bloom but I only saw a few bees. There's a substantial amount of goldenrod about to bloom. Hopefully that will give them a good fall flow and get them prepared for winter. The bottom box had four combs started and one little bit. 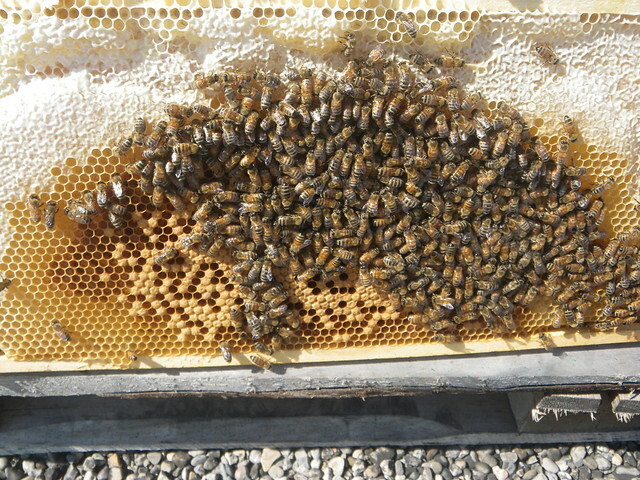 They built perpendicular again on the east side of the hive near the entrance. The seed frame was hatching out but no other new brood. 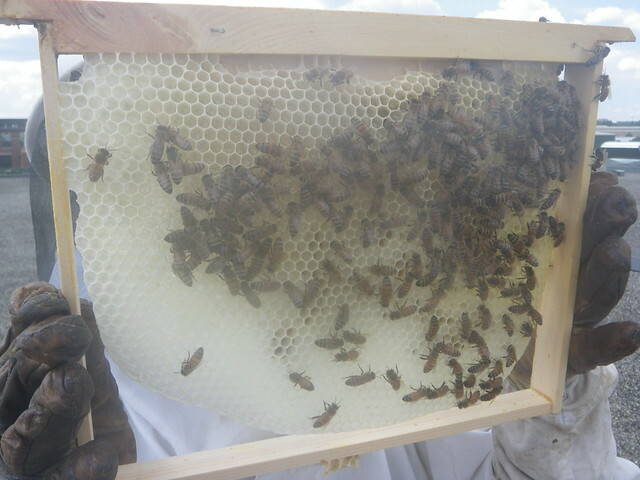 One frame was well on its way to becoming honey. 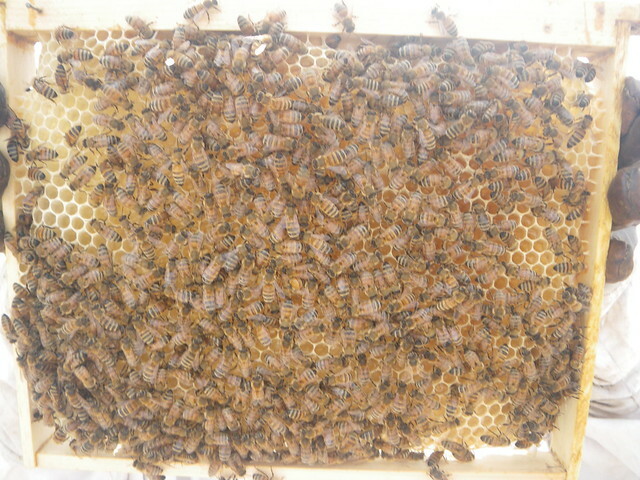 The middle box had a good mix of capped and some young brood and eggs. 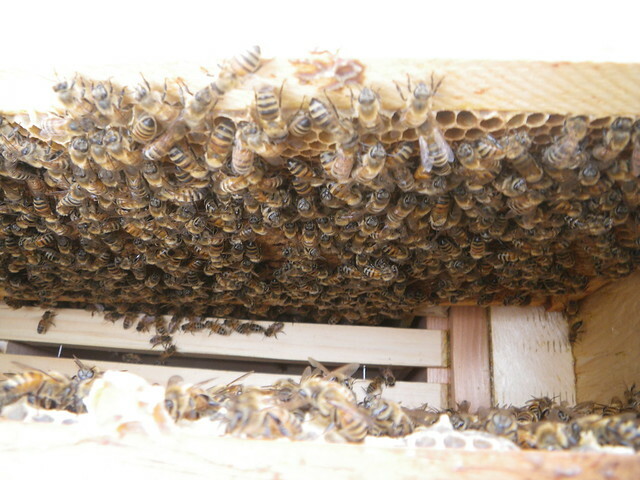 The top box had its west most frame on its way to honey, the middle two still had loads of capped brood with some honey. 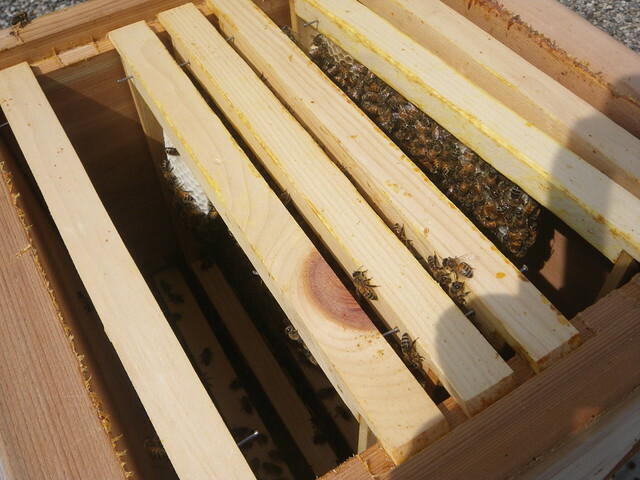 Both boxes had loads of brood and a small amount of pollen and nectar. 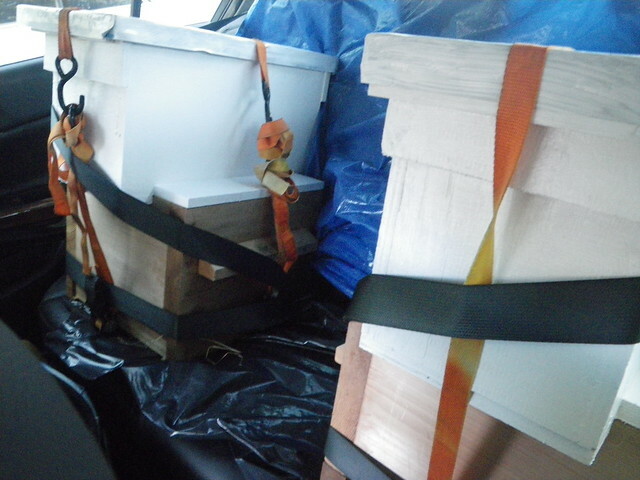 All frames were significantly drawn, but leaving a bee space at the bottom bar of the frames. 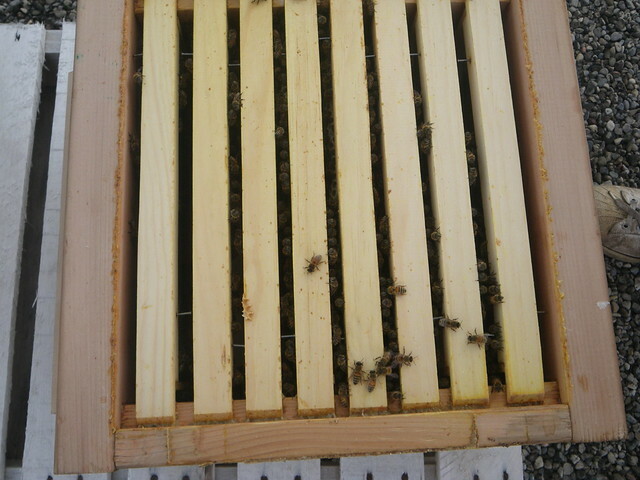 I nadired a new box with two seed combs (one from each box above). I didn't check the conversion box with the lang frames. 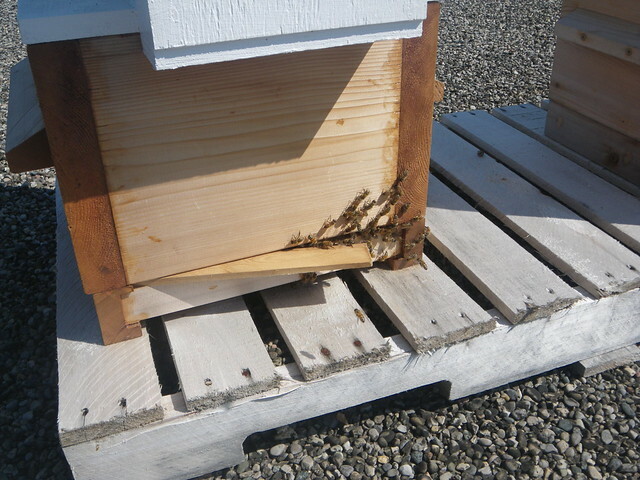 We started checking the new box we seeded with a frame last visit. They had four combs well on their way and a fifth one started. All of them perfectly straight. A little less than I thought they might have built in two weeks but still pretty good. The only problem is I wanted them to start using this box for brood. Instead it was nectar and a bit of pollen. 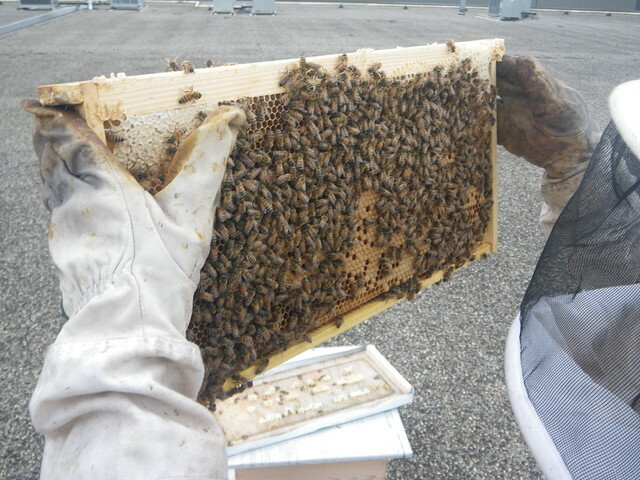 I guess the seed comb didn't have enough eggs to entice nurse bees and the queen to come down. 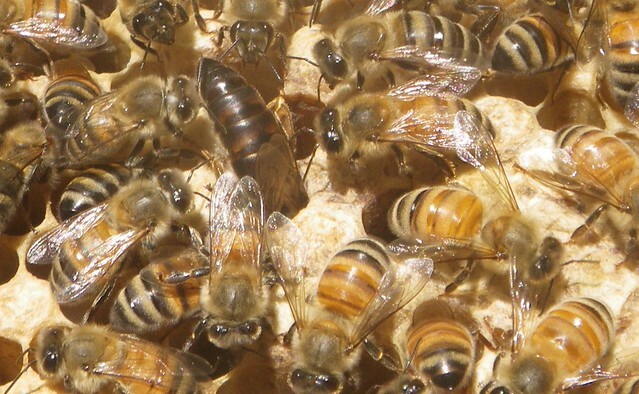 To me this looks like the queen is not able to lay as much as she might like and they are putting more energy into building up stores than building comb than I would like. 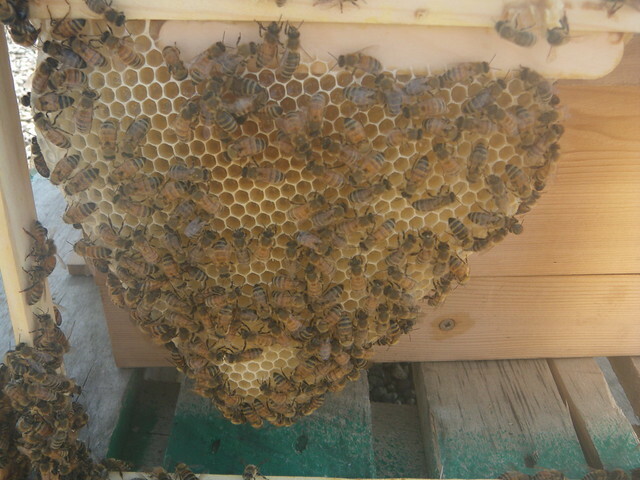 I checkered the combs in the bottom box to see if that would help put an emphasis on comb building. 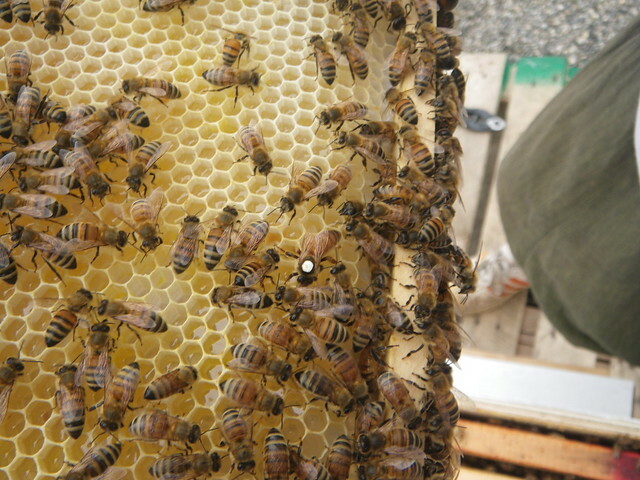 It would also help ensure they build those combs straight on the frames. 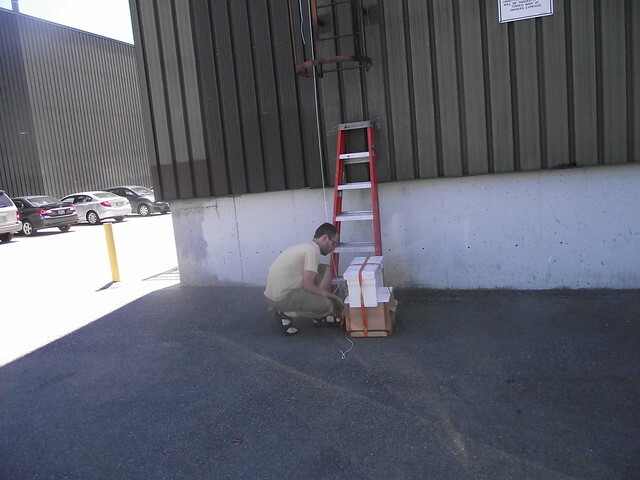 We opened up the entrance reducer a bit. 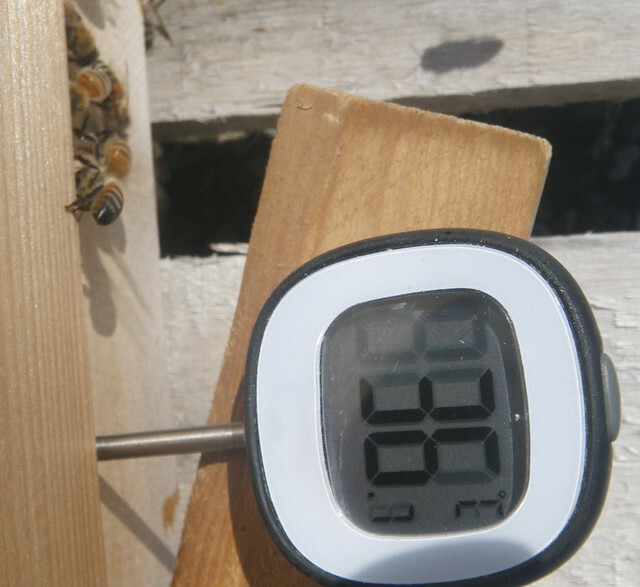 I felt I needed to add another seed comb to the nuc and see if my luck at baiting the queen to come down will be better the second time. 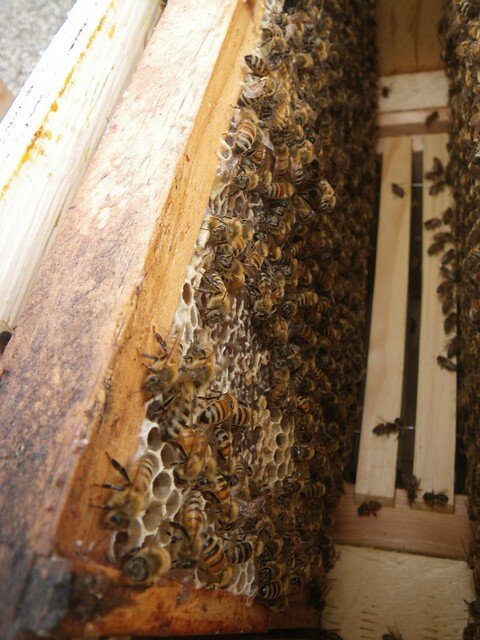 I was worried about the potential of a crisis developing from a small population and reduced space to lay if they didn't start making new brood comb right away. 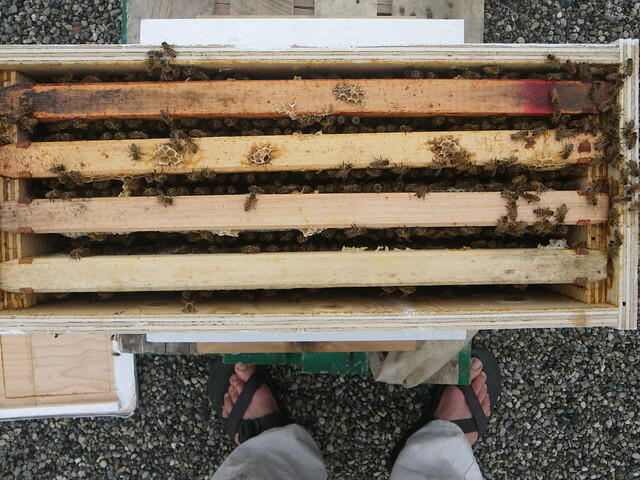 I had to uncap a little bit of honey to make space for my bait frame in the nuc box. A little was enough and I was able to do it quick and smoothly without much fuss. Rain water had accumulated in the container I had left with crushed comb. 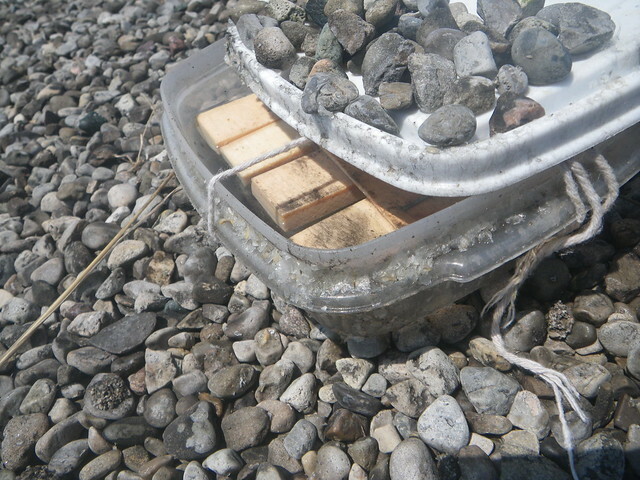 Bees were drinking from it, but it was also attracting wasps and hornets. 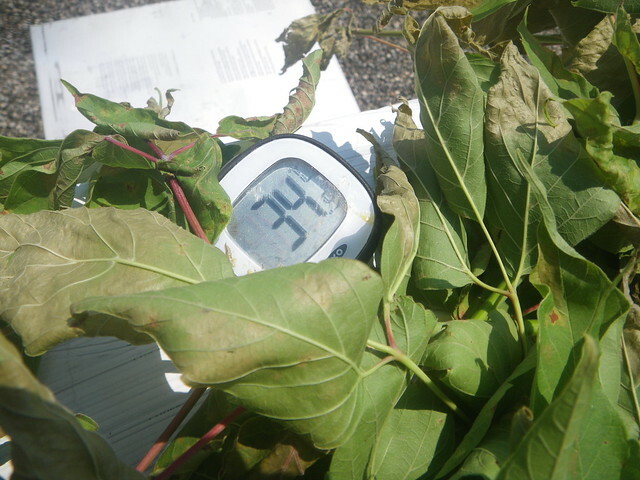 We had entered a heat wave. It was 33 degrees Celsius. 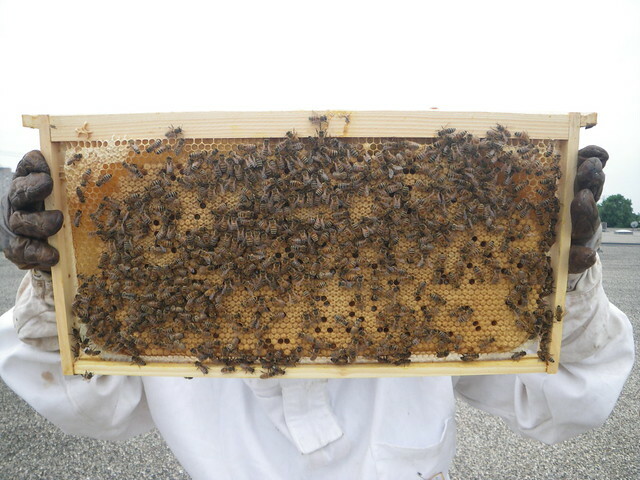 The sweet white clover blooming very close to the hive was very popular with the girls. Despite the heat, there didn't seem to be significant amount of bearding. Of course their numbers are not very high. Just steady fanning at the entrance. They had a decent sized comb going on the bait frame. 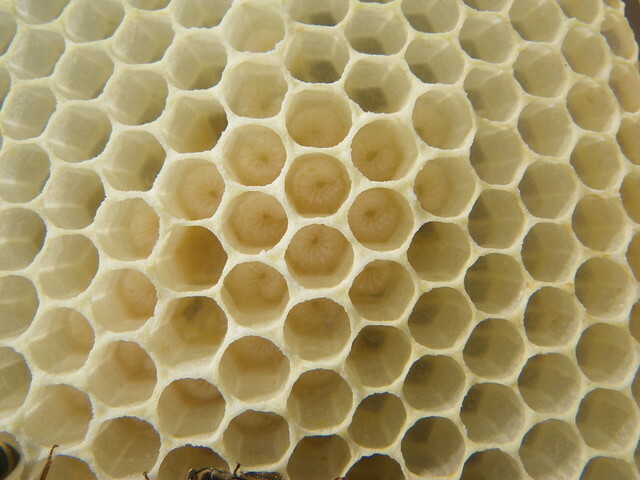 Some nectar on top, but a good number of eggs under that. I had modified the bar I use to hold my warré fram in the lang nuc with wooden blocks to prevent extra comb being built on the sides of the frame. It worked perfectly. In the bottom box They now had seven combs in the works. 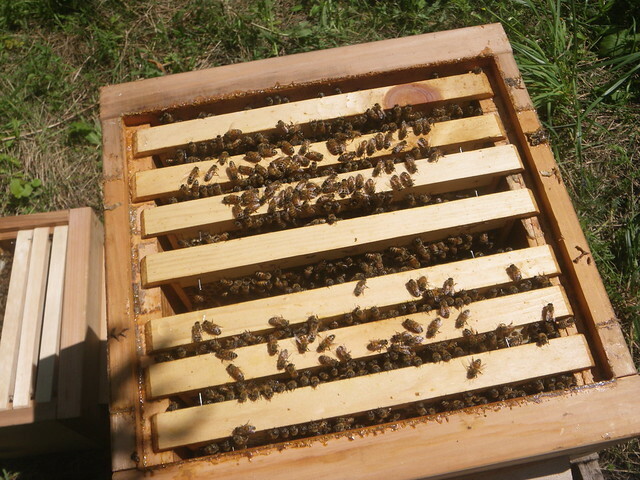 I seeded the new warré comb with the eggs in a new box in between the nuc and the other warré box. I opened up the entrance a little bit more and placed some tree branches on the roof to provide some relief, if only temporary from the heat. 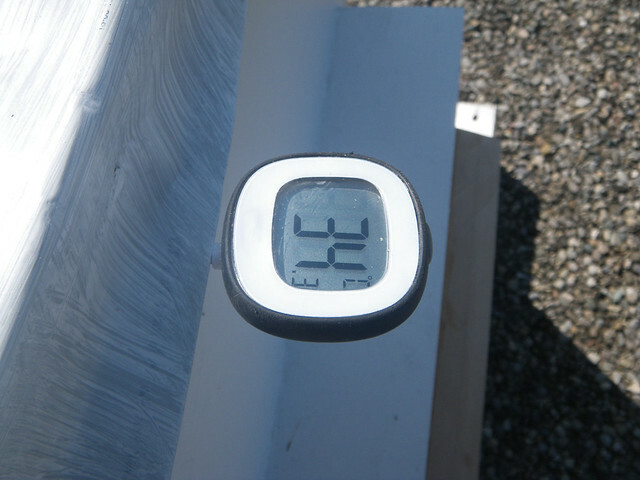 This did quickly drop the temperature on the outside of the roof. 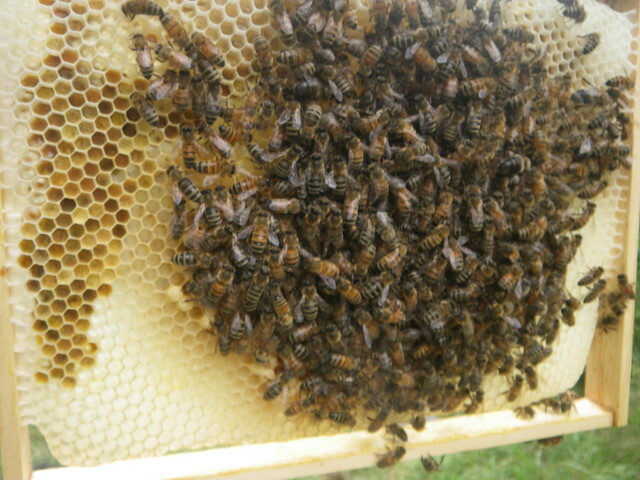 The bucket water feeder system I had left them when we first set up the bees still had some amount of water. I'm yet to see a bee use it. My design probably needs some improvments. 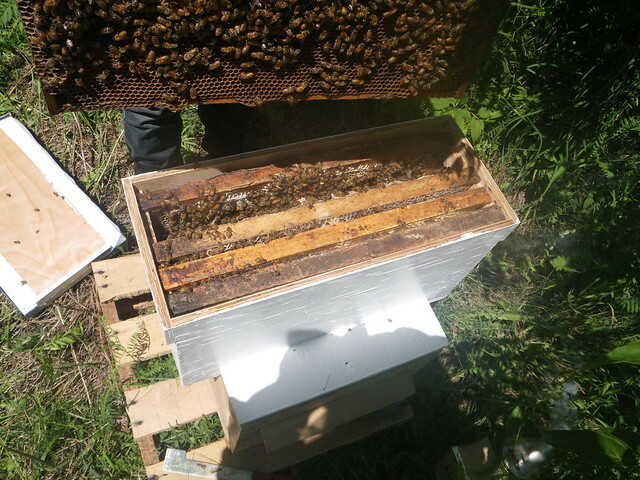 We started this hive with a nuc-to-warré converter box, very similar to what we did with the sun hive. 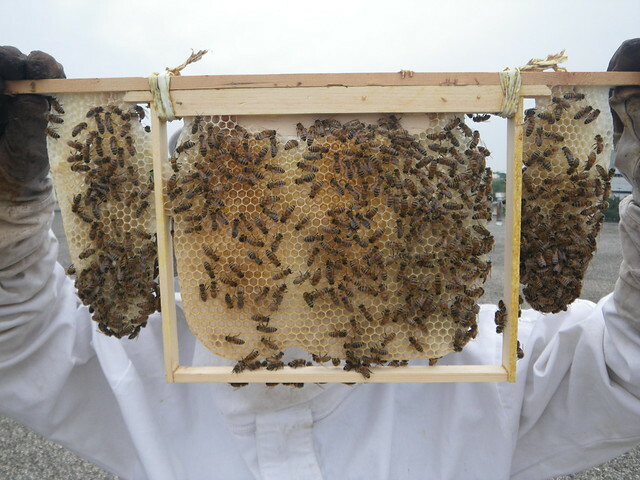 As the four-frame nuc was a little low on capped brood the breeder gave us a bonus frame filled on both sides with capped brood. 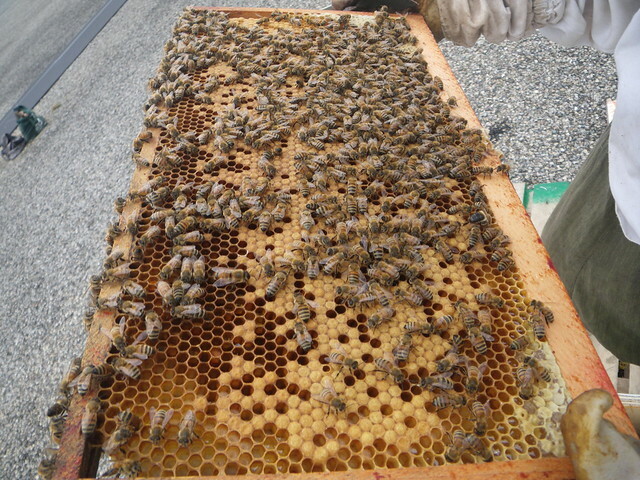 The other four frames contained good amounts of pollen and there was some amount of eggs on each frame. 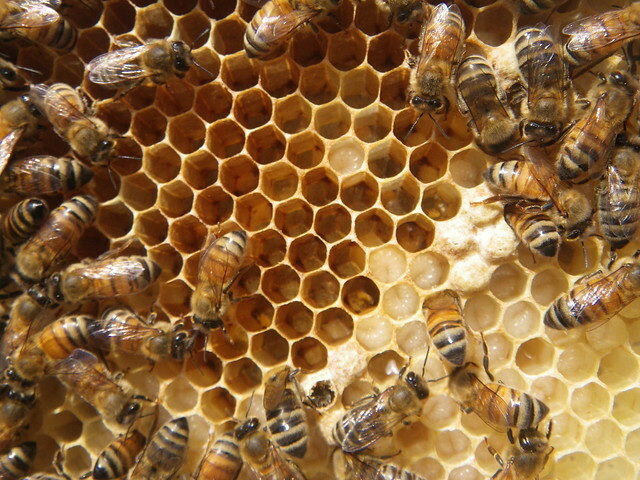 The population seemed good, but not as strong as the sun hive. 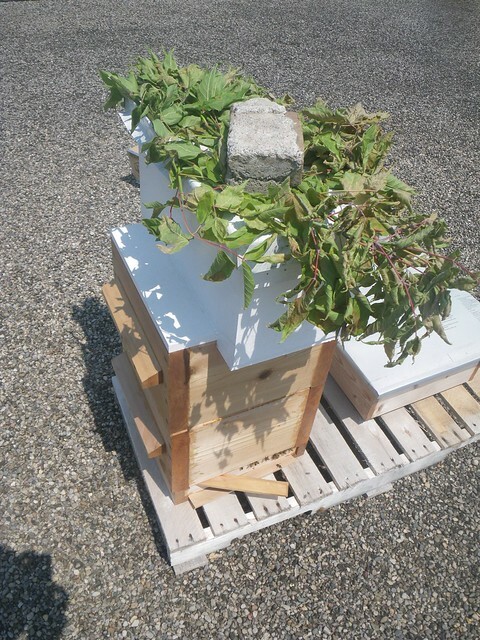 We gave this hive 500 ml of 1:1 sugar water. 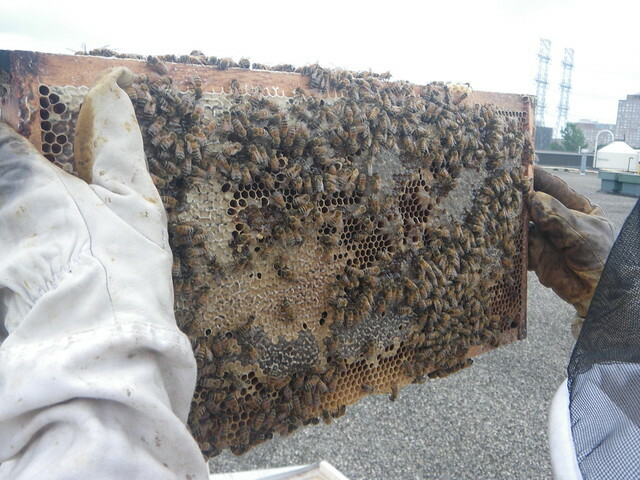 Most cells seemed to be in use for brood or food. A good number of eggs. 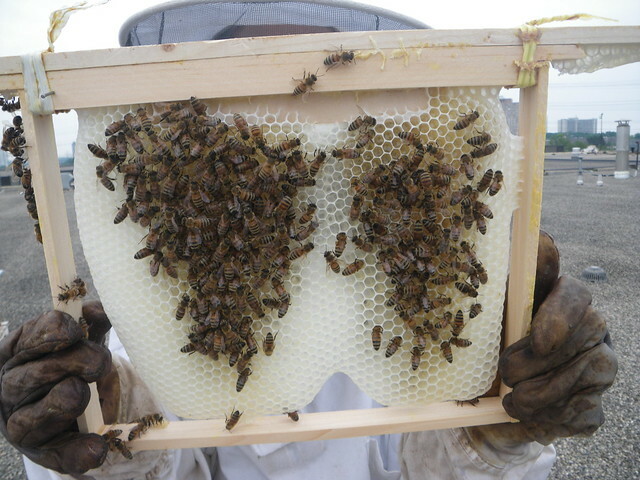 One side of the solid brood frame had hatched out, but the other side was still capped. We spotted our dark queen bee. They hadn't touched the sugar water. 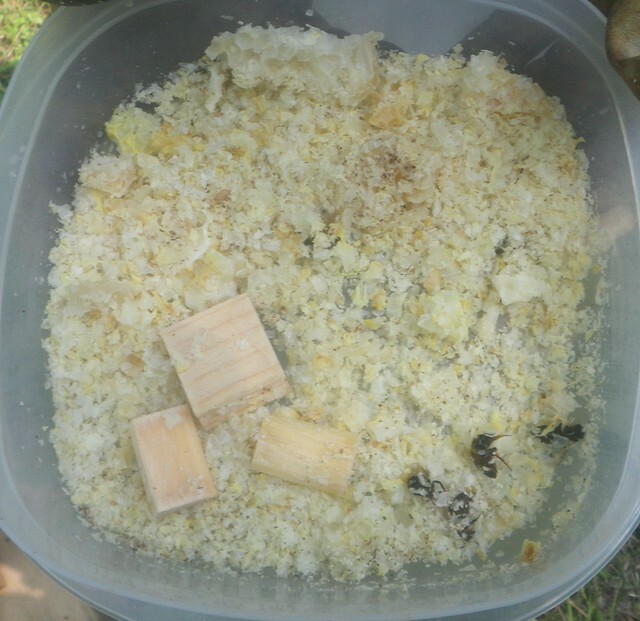 We removed it and replaced it with some crystalized crushed honey comb mixed with a little water. 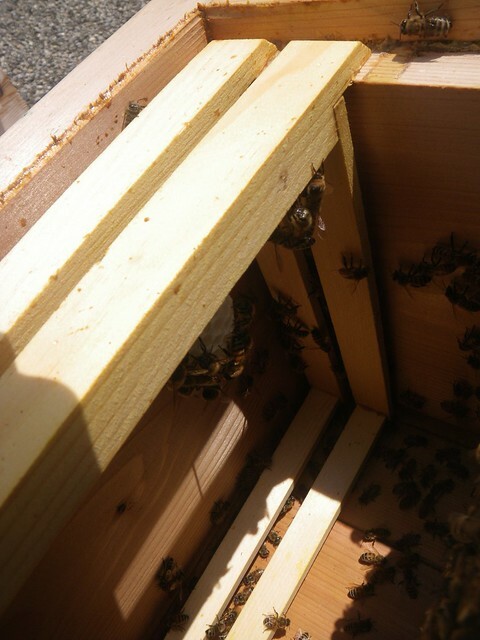 Bees hanging in the bottom warré box but no comb. 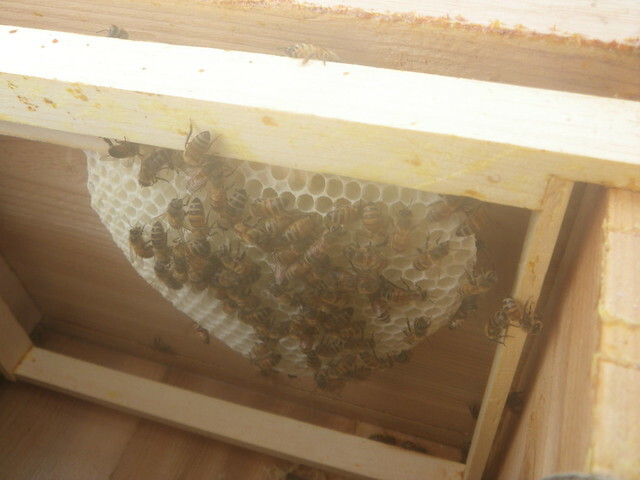 So we added a frame with comb and eggs started in the sun hive. 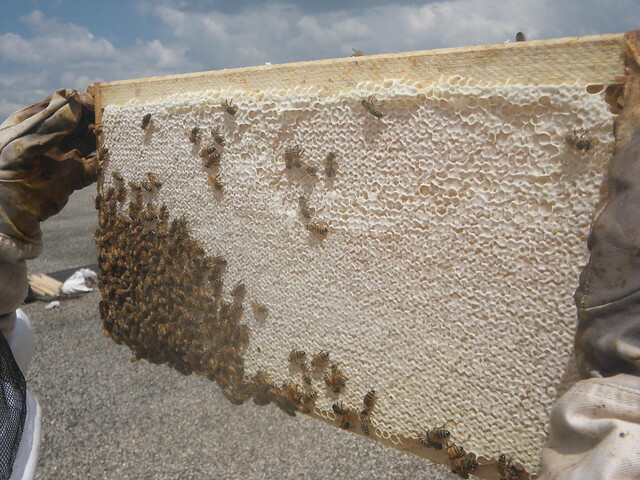 They had cleaned up all the honey comb we left them last time.